I purchased these two Salvador Dali prints from The Divine Comedy series. These are watercolor prints from wood engravings. 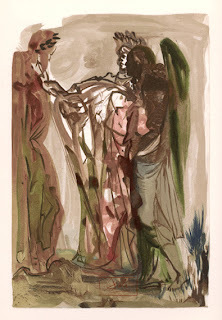 There is some dispute over Dali's involvement in the actual creation of the wood plates but the artwork is certainly his. "The Divine Comedy" was published by Joseph Foret and was carved and printed by Les Heures Claires, arguably the finest printer ever of art books. Foret required Dali to oversee the work on the 100 different woodblock prints. He pencil signed all of the prints in the first 100 books of the tirade. The signatures on my prints are signed in the block meaning it is basically a stamp of Dali's name. 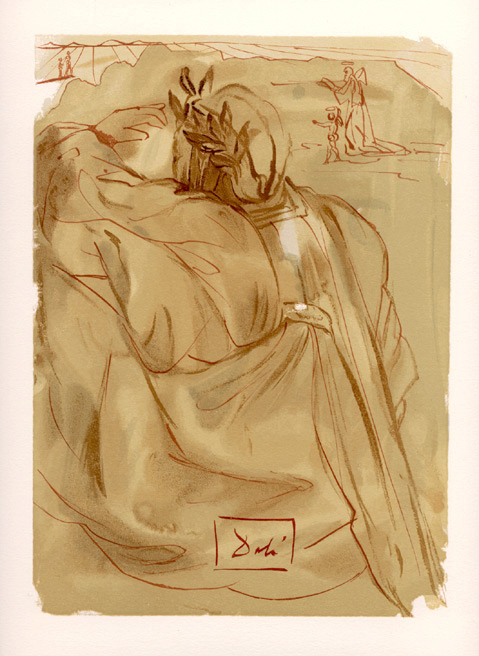 I've seen pencil signed prints from this series for sale on the internet for about 4 to 8 times the cost of block signed prints. To celebrate the 700th anniversary of Dante's birth, the government of Italy planned to issue a special edition of The Divine Comedy. For this issue, Dali created 101 watercolors between 1951 and 1960. In 1954, La Libreria della Stato published a brochure with seven of the paintings reproduced full size as lithographs, together with sample pages of the text. The prints are 16 1/2 inches x 11 inches with narrow margins. Due to the opposition these prints created, the Italian government dropped the project and postage stamps were issued instead. Several years later, Joseph Foret, in Paris, who had previously published other Dali suites such as Don Quichotte, started production of the prints by wood engraving. Master engravers worked from 1959 - 1963 to carve 3500 separate wood blocks for the 100 prints. The Divine Comedy project was then taken over and completed by Jean Estrade of Les Heures Claires. I recently acquired an ink print of St. John crucifix of Christ (? ), that looks like the 1951 crucifix, but it is just an ink outline of Christ as though he were hanging on the cross in that picture. 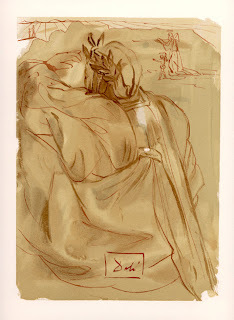 It is about 6"X8" and has S Dali signed in pencil underneath along with the date 1951 under the signature. I was wondering if you knew anything about it as well as any possible value.